The score is not meant to be executed. I made the score and the sound files in Sibelius and mixed the music in Logic. 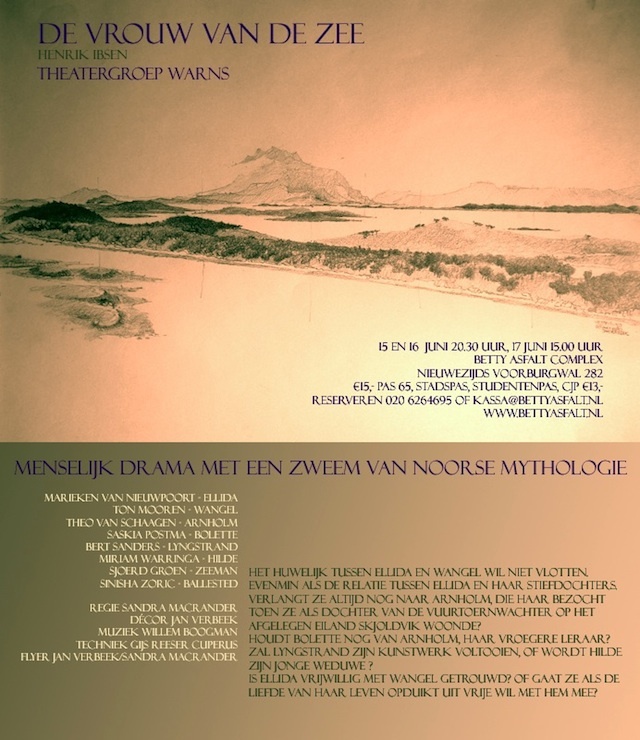 In the Introduction, seven leitmotifs have been introduced: ›Where the fjord merges into the sea‹, › Ellida, the strange man and the sea‹, ›Wangel‹; ›Ellida‹; ›Wangel and Ellida‹; ›The strange man‹ and ›The open sea‹. In general, the percussion represents the sea and the melodic instruments and choir represent the characters. The entr'actes are based on the motifs introduced in the Introduction. The music was commissioned by theatregroup WARNS and written in 2012. The first performance took place on June 15, 2012 in Amsterdam by WARNS, directed by Sandra Macrander. The score was written for percussion, flugelhorn, piano's, strings, female choir, male choir, theremin and synthesizer sounds, including a ›Funk Synth Bass‹, ›Synth Bass‹ and ›Synth pad‹. The score was created in Sibelius whereupon the parts were transferred to and mixed in Logic. With it, the help of Anthony Fiumara was indispensable. Thank you Anthony!